HE world’s largest aircraft, developed by aerospace venture Stratolaunch, completed its first flight test on Sunday. The aircraft is designed to launch rockets into orbits from the air. It is designed to carry into space, and drop, a rocket that would in turn ignite to deploy satellites. With a dual fuselage design and wingspan greater than the length of an American football field, the airplane took off from Mojave Air and Space Port in California at 6.58 AM (Pacific Time), said Stratolaunch in a statement, Xinhua reported. Achieving a maximum speed of 189 miles (302.4 km) per hour, the plane flew for 2.5 hours over the Mojave Desert at altitudes up to 17,000 feet. As part of the initial flight, the pilots evaluated aircraft performance and handling qualities before landing successfully back at the Mojave Air and Space Port, according to the company’s statement. “What a fantastic first flight,” said Jean Floyd, CEO of Stratolaunch. “Today’s flight furthers our mission to provide a flexible alternative to ground launched systems. We are incredibly proud of the Stratolaunch team, today’s flight crew, our partners at Northrup Grumman’s Scaled Composites and the Mojave Air and Space Port,” he added. Regarding initial results from Sunday’s test flight, Stratolaunch said the test team performed a variety of flight control maneuvers to calibrate speed and test flight control systems, including roll doublets, yawing maneuvers, pushovers and pull-ups, and steady heading side slips. Moreover, it conducted simulated landing approach exercises at a max altitude of 15,000 feet mean sea level. Stratolaunch was founded by the late Microsoft co-founder Paul Allen in 2011 to develop the large carrier airplane as a flying launch pad for orbital-class rockets. 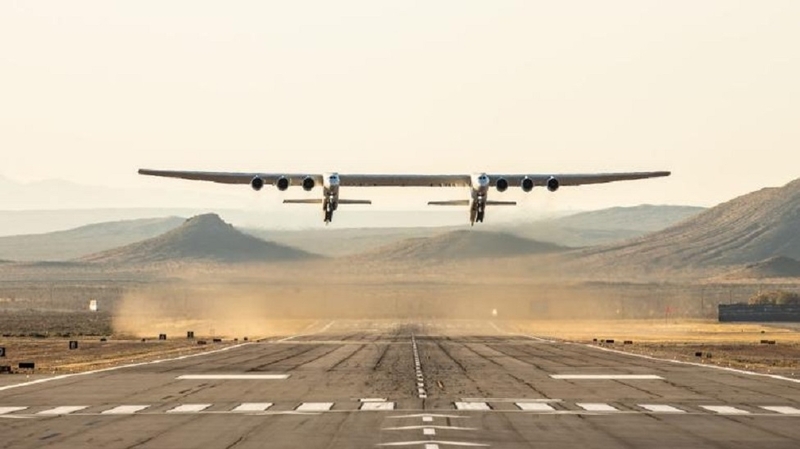 The aircraft has a world-record wingspan of 385 feet, and is 238 feet long. It is wider than any airplane on the planet. It weighs half a million pounds, according to a CNN report. “A historic milestone for the #Stratolaunch team with this record setting aircraft taking flight! This is about going to the edge of space and beyond!” tweeted Thomas Zurbuchen, associate administrator for NASA Science Mission Directorate. “I only wish the late @PaulGAllen could see this - his memory and impact lives on,” he tweeted.